Besix/Six Construct, a leading player in the construction of commercial and residential buildings, said one of its units has completed the work on the Dubai Water Canal in Business Bay development in the emirate. Belhasa Six Construct is a Dubai-based entity of Besix, a leading multi-services company operating in the construction of commercial and residential buildings, sport and leisure facilities, infrastructure and marine-related projects. The project, which was executed under supervision of the Dubai Roads and Transport Authority (RTA) in partnership with Halcrow-Parsons, started in January 2015. The scope of work included the construction of the Dubai Creek extension as well as a fully navigable channel from the Dubai Creek at Al Ras to Jumeirah, through the Business Bay development, said a statement from the Besix/Six Construct. The project required the diversion of existing utilities and key services, which occurred in parallel with the removal of earth bunds within the Business Bay section of the canal, and dredging up of the canal bed to reach the level of -4 to -6 metres, thereby allowing construction of the remaining sections of Quay Wall. Pierre Sironval, the managing director of Besix/Six Construct, said 3.2 million cu m of soil were dredged for the canal and 15,000 concrete blocks of 40 tonnes each were used to fortify the banks over a total length of 15 km. "The main challenge of the project was hence the diversion of the underground services in order for the excavation and construction of the 3-km-long canal to proceed smoothly," stated Sironval. "In addition, the installation of three sculptural pedestrian bridges in a record period was a fantastic achievement and we are proud to have contributed to this historical project in the UAE," he added. On the key challenges, Sironval, said: "During the construction process, we had to be extremely vigilant and careful whilst working on the Dubai Canal, as it cut through a high profile residential area, as well as some of the city’s main traffic arteries such as Al Wasl Road, Jumeirah Beach Road and Sheikh Zayed Road." "To minimise the impact on the day-to-day traffic and the wellbeing of the local residents, the resourceful engineers tailored their planning and methods of execution to make sure they caused the minimum amount of disturbance, and ensured that everything was orchestrated along with the RTA to run as smoothly as possible. The wellbeing of the residents is always our top priority," he added. According to him, the canal’s width ranges from 80 to 120 m. "Various bridges were built at a height that will allow luxury yachts and other boats to pass underneath, and the canal culminates at an artificial crescent-shaped island along Jumeirah Park," he noted. “With more half a century experience in the Middle East, working with gravity blockwork walls, quay wall construction is one of the company’s main competencies, therefore we do not expect any issues once the site is open,” stated Sironval. 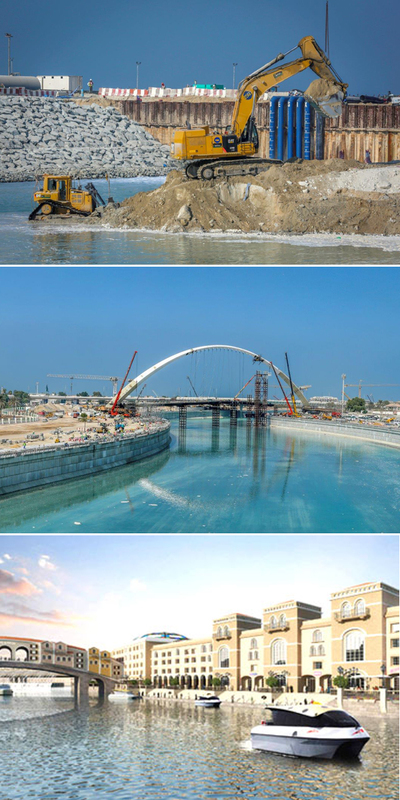 Treatment of existing hyper-saline water impounded within the lagoons of Business Bay were also implemented by diluting the existing water and discharging it back into the sea through a 3-km-long pipeline, and re-flooding the canal after the completion of the works. In addition, the project includes the development of four water taxi stations, starting from the creek right up to Business Bay and Jumeirah. The existing natural park at the creek was kept untouched, thereby avoiding the area where the flamingos are settled, said the statement.